Introduction: Tissue engineering is a promising strategy for bone regeneration in repairing massive bone defects. The surface morphology of implanted materials plays a key role in bone healing; these materials incorporate osteoinductive factors to improve the efficiency of bone regeneration. Materials and methods: In the current study, nanostructured hydroxyapatite (nHAp) microspheres were prepared via a hydrothermal transformation method using calcium silicate (CS) microspheres as precursors; the CS microspheres were obtained by a spray-drying method. The nHAp microspheres constructed by the nano-whiskers significantly improved the ability of the microspheres to adsorb the bioactive protein (BMP-2) and reduce its initial burst release. 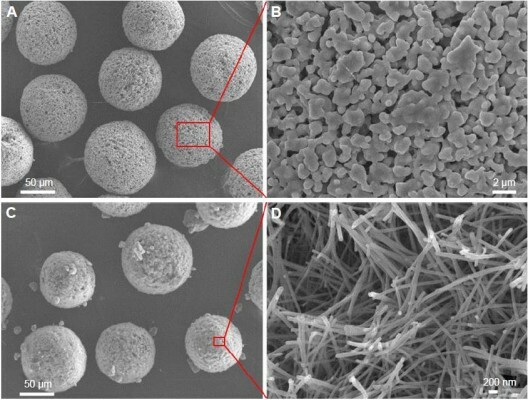 To evaluate the in vivo bone regeneration of microspheres, both conventional hydroxyapatite (HAp) and nHAp microspheres were either loaded with recombinant human bone morphogenetic protein-2 (rhBMP-2) or not loaded with the protein; these microspheres were implanted in rat femoral bone defects for 4 and 8 weeks. Results and discussion: The results of our three-dimensional (3D) micro-computed tomography (CT) and histomorphometric observations showed that the combination of the nanostructured surface and rhBMP-2 obviously improved osteogenesis compared to conventional HAp microspheres loaded with rhBMP-2. Our results suggest that the nHAp microspheres with a nanostructured surface adsorb rhBMP-2 for rapid bone formation; they therefore show the potential to act as carriers in bone tissue regeneration.